Walking Fort Bragg: Hi Mom! Remember the "web cam" I mentioned in the previous blog? 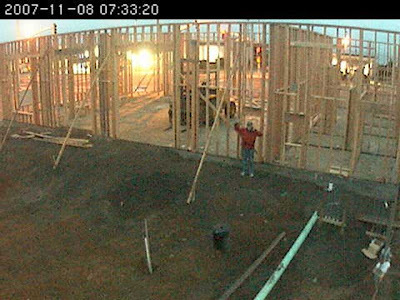 I happened to notice the gate was open at the job site this morning so I called my brother in Coupeville, Washington and asked him to "log onto" the MendoLake webpage and do a "print screen" of me and then e-mail it to me! That's me "multi-tasking"; talking to my brother on the cellphone and waving at the same time! By the way, I notice they have not corrected their video camera for standard time. This photo was taken at 6:33 and twenty seconds!! 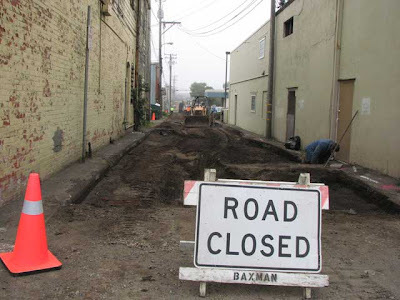 Progress is progressing on the alley re-do between Main and Franklin, Alder and Redwood. 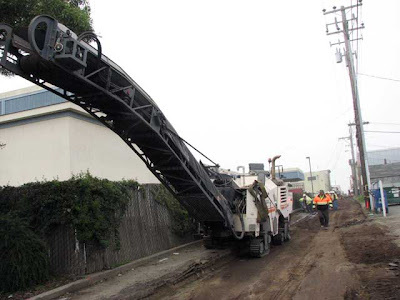 This is the machine that "eats" the old asphalt. Notice how the "tracts" are adjustable for different heights. Quite a remarkable machine. 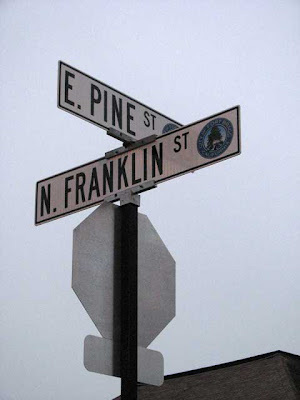 I noticed the new street signs are in place along Franklin Street. I like them! Today's Astronomy Photo of the Day informs me the planet, in the moon photo I took on the 5th of November, was Venus, not Saturn.